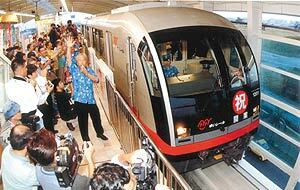 More than 300 people were waiting in line Sunday morning to be part of the Okinawa monorail’s debut runs. They milled around outside the Naha Airport Station of the Okinawa Urban Monorail as the first regular train took off exactly at 6 a.m. headed towards Shuri. Many railroad buffs from mainland had camped out outside the station the night before to make sure that they would not miss the very first train run open to public. As the station doors opened at 5:20 a.m., they were the first in line. With each train having a 165 passengers capacity, those who came later had to wait another six minutes for the second train to leave. All in all, more than 60,000 people took the opening day train ride, according to Monorail officials. The first day did not, however, go without a glitch. At about 8:25 pm, the trains suddenly stopped, and did not move for two hours. A subsequent investigation found that a two-year-old boy had left his finger in the door as they closed. A fellow passenger yanked the doors open to free the child’s finger and bent the door slightly in the process, preventing it from closing properly. That affected the train’s computer system and stopped the train. The boy was unhurt but scared. Because of the accident, some people had to wait inside the trains for as long as an hour before they could be moved to the nearest station and evacuated. According to monorail officials, there were reports of four incidents of people getting clipped by closing doors during the first day. No injuries were reported. Officials also said that in the rush and excitement of the first day, many people left belongings behind, including bags, cameras, cell phones and other personal items. Those who are missing their goods can call 098-859-6601. With lessons learned from the first day, the company immediately placed stickers to train windows reminding people to take their belongings when they leave the train. They also placed warnings at doors telling passengers not to leave their fingers between the sliding doors. They also added verbal warnings that are broadcast over the trains’ announcing system.